Microsoft held a big Surface event in Shanghai this morning. While the event was basically impossible to watch in America, with a broken liveblog and zero English livestreams, savvy viewers (and those fluent in Chinese) might have caught the big news: There’s a new Surface Pro. It’s been more than sixteen months since Microsoft’s landmark tablet-laptop hybrid saw an update. In the intervening time, Microsoft has seen a lot of competitors attempt to encroach on the 2-1 device space. While some of those clones have been aesthetically delightful, few have approached the slick combination of design and quality the Surface Pro delivers. So a refresh is welcome, and this year’s devices could fix some of the Surface Pro’s most annoying problems. 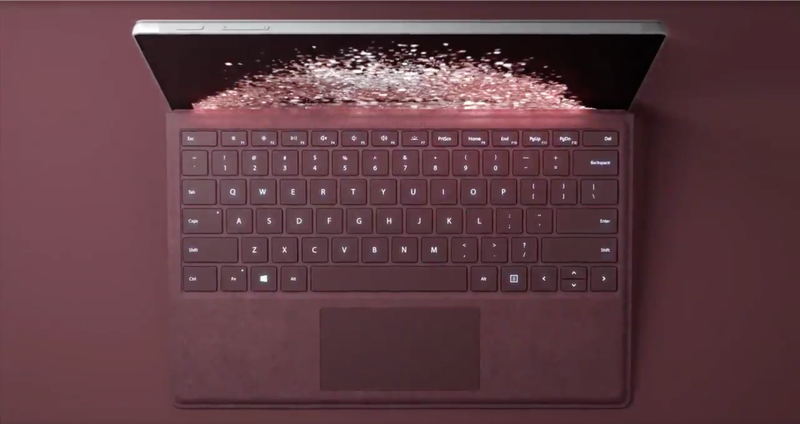 Dubbed the New Surface Pro, Microsoft has tossed its number naming scheme aside. Now if you want to know how fast a new Surface Pro is you’ll need to check for the date of manufacture instead of looking for a number tacked onto the backside of the name. You’ll also need to dig into the menus and find the About page, so you can figure out if your New Surface Pro has a seventh generation Intel Core m3, i5, or i7 processor. Both the i5 and Core m3 variations will get rid of one of the Surface Pro’s loudest problems—the internal fans. I didn’t realize how many fanless devices I use until I spent an hour playing Civilizations VI on a roaringly loud Surface Pro 4, so I’ll be curious to see how good the passive cooling on the new Surface Pro might be, and whether Microsoft will throttle performance to keep the device’s temperature down. Note: The i7 variant will maintain one fan. Dropping the fans for the i5 and Core M3 means Microsoft can pack in a larger battery, 47 watts versus the 40 watt battery found in the Surface Pro 4. Microsoft claims the bump in battery, plus the more efficient seventh generation Intel processor, gives the New Surface Pro four more hours of battery life, taking the average from 9 hours of video streaming to 13 hours. That will be impressive if true, but we won’t know for certain until we have the opportunity to check it out ahead of it’s launch date later this year. Dropping the fans, upping the speed, and improving battery life are all pretty typical claims computer manufacturers make when refreshing a big line like the Surface Pro. So Microsoft needs something more—something flashy. This time around, it’s clear that Microsoft wants to set itself apart from its competitors with improvements to the Surface Pen. Despite what appear to be big improvements here, if you aren’t an artist, it will be difficult to get too ridiculously excited. For starters, the Surface Pen has added tilt support, the ability to register the sides of the pen and not just the tip. Additionally, the company claims it’s gotten pen lag down to 21 milliseconds. That’s half of what Microsoft claims Apple does with an iPad and Pencil, and a full third of what it attained with the Surface Pro 4. The hope is that drawing with the Pen will feel just like drawing with a real pen—there’s no lag when you’re putting pen to paper. That’s very exciting if you’re a professional illustrator. For the rest of us, it will just be a couple of more facts to list off when our loved ones see the credit card statement and ask why we spent so much on a new computer. Besides the above changes, the new Surface Pro will also have an LTE option, in case you want internet all the time, and it will be the first mobile device that works out of the box with Microsoft’s $100 Surface Dial. Microsoft also confirmed that the new Surface Pro won’t have USB-C. Instead it will continue to provide USB 3.1 via a traditional USB-A port (the rectangular one you’re accustomed to), and it will get power via the Surface charging port. To be sure, this isn’t a revolutionary redesign for he Surface Pro line. It’s a standard refresh. The faster chipsets and fanless design are welcome, but it would’ve been nice to see Microsoft embrace some more ambitious ideas this time around. Indeed, failing to fall in line with the emerging USB-C standard seems like quite an oversight. The new Surface Pro is available for pre-order today starting for $800, and will ship June 15th. If even half of Microsoft’s claims hold true, this could be the laptop-hybrid to beat. Though we won’t know for sure until we get our hands on it closer to launch.